I bet you thought when you read the title of this post that it was about Isabella and how she’s growing so quickly and how fast time is going. It’s actually about me and how I made a decision to grow up in one area. Ready? I decided to give up my belly piercing. I’ll wait while you pick yourselves up off the floor. I got my belly button pierced when I was in college. It was my rebellious way of getting around the “no tattoo until you graduate and have a real job” rule laid down by my parents. No tattoo? Fine, I’ll pierce something! 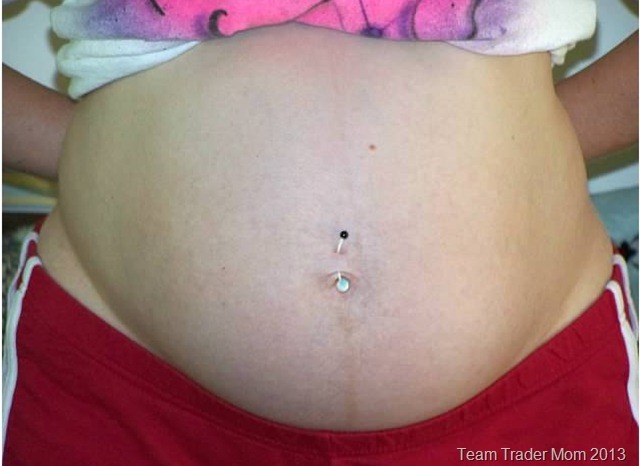 The belly button seemed to be the safest, easiest, least visible way to do just that. I could hide it on a daily basis yet still have the badge of honor of having a piercing – and of course show it off on the beach or whenever it was appropriate to bare the mid-drift (keep in mind this was back when I had a flat stomach and wasn’t horrified at the thought of anyone seeing my stomach). Obviously that’s not me. My stomach wasn’t that flat. So I had some strange dude stick a needle through my skin and never looked back! Until I got pregnant with Isabella. Oddly, once I started showing, I was immediately concerned about what would become of said piercing. I knew my ever expanding belly would outgrow my normal belly bar and I was sad at the thought of taking it out and the hole growing shut. So I ordered a special pregnancy bar that is longer to accommodate the growth. It worked like a charm! With this pregnancy, I didn’t even think about the belly ring until we had the ultrasound and the tech asked me how long I was going to be able to keep it in. I told her what I had done previously and added the comment that I might also just let it go this time. This was the first time I had ever thought about letting it go. It kind of surprised me and I’ve been thinking about it off and on ever since. Lately, my “innie” has started to become an “outie” as the baby slowly grows. This has caused the ring/bar to stick out too and become more visible through my clothing. I knew it was time to make a decision one way or another when it was becoming sore too, as a result of the extra strain. It was either buy a pregnancy bar (I lost my old one in the move) or give up the piercing all together. I decided it was time to give it up and grow up. Not that having piercings as an adult means you’re not a grown up. I just felt that for me, I was holding on to old college days and an image that’s not really me anymore. CJ asked if taking it out would mean I would lose my inner rebel. I don’t think so. I mean, I still have my tattoos (that I got like, the day after I landed “a real job”, thank you very much. My parents were thrilled) and might even get another one in the next year or so (we’ll see…). Also, there are other ways to rebel – change my hair, buy funky clothes, wear white after Labor Day, dip my carrots in peanut butter…. Now that I’ve done it, I kind of feel free. I don’t know why. It’s not like the piercing was holding me back or anything. I guess it just goes to show that it was the right decision. And my profile is much smoother now too! Isabella thought it was crazy when I showed her my “new” belly button. I believe her exact reaction was, “Whoa!” It’s caught me off guard a couple times too. Like in the shower. I use a loofah instead of a washcloth and I have to be careful around that piercing that it doesn’t get caught in the mesh. Well, that’s not a problem now! I sometimes spend like an extra minute just scrubbin’ my tummy because it’s so easy! There are also times during the day when I unconsciously rub my belly (it’s a pregnancy thing…like reassurance to the baby that mama is here or to me that the baby is still there) and it’s still a surprise to find it so smooth. So there you go. I guess 36 was the magic year for me to grow up! At least in one area. Just don’t ask me to give up mac n’cheese. Got more time? Then click to some other posts!